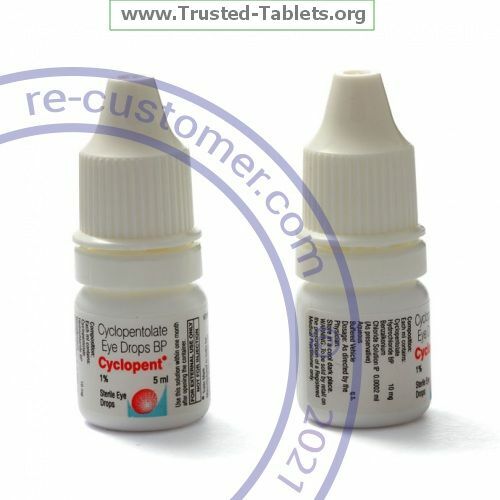 CYCLOPENTOLATE is used in the eye to widen your pupils, so they won't respond to light. It is normally used for diagnostic procedures. This medicine is only for use in the eye(s). Do not take by mouth. Wash hands before and after use. Tilt the head back slightly and pull the lower eyelid down with the index finger to form a pouch. Squeeze a single drop into the pouch and close your eyes. Apply gentle pressure to the inside corner of your eye for 1 to 3 minutes. If you are using more than one drop, repeat this process with 5 minutes between the drops. Do not touch dropper tip to any surface to prevent contamination. If more than one eye product is being used, the products should be administered at least 5 minutes apart. Use your medicine at regular intervals. Do not use it more often than directed. Contact your pediatrician or health care professional regarding the use of this medication in children. Special care is needed. Visit your doctor or health care professional for regular checks on your progress. Report any serious side effects right away. Stop using this medicine if your eyes become inflamed, painful or have a discharge, and see your doctor or health care professional right away. If you wear contact lenses, remove them before using this medicine. Contact lenses may be put back in 15 minutes after using this medicine. Be careful not to touch the tip of the dispensing container onto the eye, or any other surface. Serious eye infections can result from contamination of eye solution. In infants feeding intolerance may occur. Infant feedings should be held for 4 hours following administration. Observe infants closely for at least 30 minutes following the use of this medicine. Store at room temperature, 15 to 30 ℃ (59 to 86 ℉). Keep the bottle tightly closed. Throw away any unused medicine after the expiration date.